For this weeks top 5 list we are going to write about the best Baja California resorts! 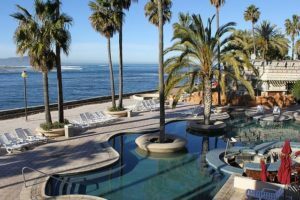 Real del Mar Hotel is a complex of 5 buildings with modern colonial architecture, located between Tijuana and Rosarito Beach, just 15 minutes south of the border and 5 minutes from Rosarito and the Convention Center of Baja California. Our facility has recreation areas that include a golf course, swimming pool, tennis court and the hip and cool Habana bar. During the, relax playing some rounds of golf or tennis. At night guests head down to Habana bar and show of their dance moves. Different types of restaurant and a spa are also a part of this resort. If you seek more comfort, Real del Mar is a residential resort, so beautiful houses are available to rent year round. 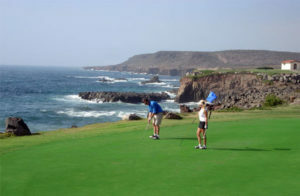 An 18-hole course with the best views of the Pacific Ocean, strategically located 15 minutes from the US border. Also, the hotel can accommodate you some of the best countryside views. 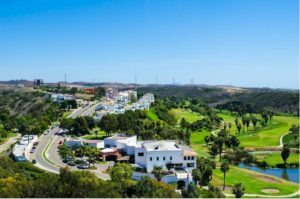 Furthermore, for real estate they offer the most exclusive land in the region, with the best views of the Pacific Ocean in a relaxed and safe environment, guarded 24 hours, so that your home is the best place for you and your family. Located 15 minutes south of Ensenada, getting there its still a little bit tricky, but with the new boulevard that runs along the coast in place, it makes things easier. This place is one of a kind. Located next to a sand bar where tides come and fill the mini bay with sea water, you can even see the strong currents entering the bay and colliding with the water trying to exit out to the ocean, this creates a really one of a kind view. You can rent hotel type rooms or villas if traveling with a big party. Las terrazas restaurant offers amazing mexican breakfast and at noon you can enjoy some fresh seafood like ceviche while getting a tan by the pool. Jet skis are available for rent. One of the bigger resorts in northern Baja. Probably one of the most beautiful golf courses in Baja. Located next to the ocean, gives exceptional views while playing golf. If golf is not your thing you can try tennis or soccer. The gourmet Dos Lagos restaurant offers really authentic dishes with a touch of the Baja med cuisine, while maintaining its own identity. At night you can try Bar la trampa for some refreshing drinks or take a stroll near the cliffs overlooking the mighty pacific. Like Real del Mar, Baja Mar also offer ocean front residential spaces for renting or buying. This was our top baja california resorts list. Remember to buy the best mexican auto insurance from Bajascape were we offer extensive coverage at the lowest cost. Visit our site and compare… the road is yours!